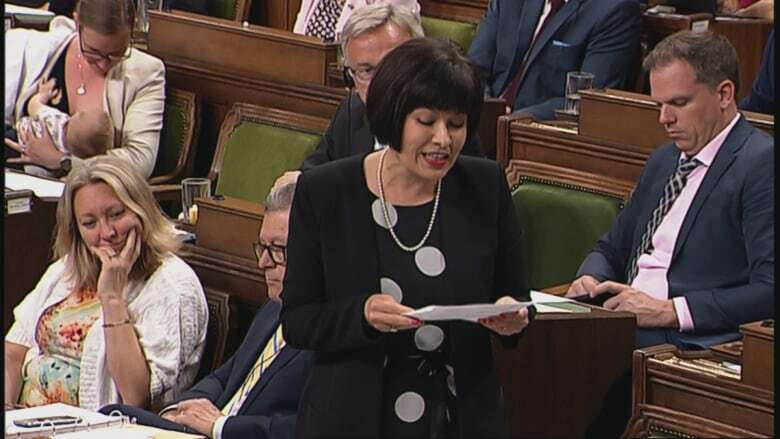 Minister of Democratic Institutions Karina Gould has received a wave of reaction after images of her breastfeeding her son in the House of Commons made the rounds online. One day, Democratic Institutions Minister Karina Gould will decide it's time to show her son Oliver the photo. It's a snapshot from the House of Commons on Tuesday. In the foreground, Health Minister Ginette Petitpas Taylor is speaking, and in the upper left corner, Gould sits breastfeeding Oliver. Of course, by the time she shows it to him, she's hoping that he doesn't understand what the big deal is. "I hope by the time that I show him … it's not something that will be strange," she told As It Happens host Carol Off. Oliver, now three months old, has become a fixture on Parliament Hill since Gould returned to her job in May. She was the first Canadian federal cabinet minister to ever take maternity leave. This week, Gould garnered international attention after images of her feeding Oliver popped up on Twitter and in news reports. Her response on Twitter was to the point: "No shame in breastfeeding! Baby's gotta eat & I had votes." Reactions — many positive, some negative — have poured in. "I've been delighted with the response," she said, though she was quick to note she's not the first female politician on The Hill to breastfeed. Others, including NDP MP Niki Ashton, have done the same — though Gould is believed to be the first minister to do so. She encouraged negative online commenters who said that feeding her son was unprofessional to review question periods when Oliver is with her. "I feel perfectly confident that I'm able to perform my functions well," she said. Her hope, she said, is to show other women that motherhood and a career in politics are not incompatible. "I'm a very proud feminist, I'm a very proud mom, and I'm a very proud politician," she said. "For me it wasn't a choice of doing one or the other."